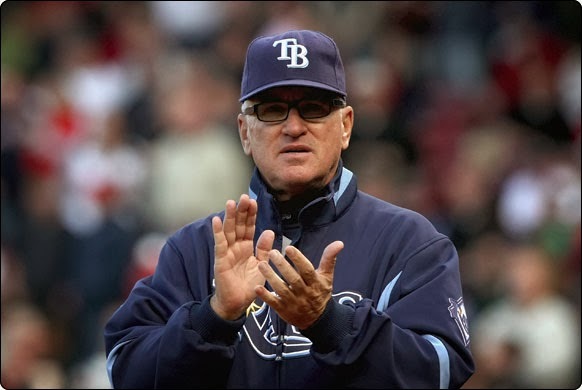 The Tampa Bay Rays may have been dumped out of the MLB playoffs last night by the Boston Red Sox, however not before their stupefyingly intelligent and ruggedly handsome manager, Joe Maddon, made 9 pitching changes and confused reporters after the game with a gigantic word. Joe Maddon makes one of 9 pitching changes on the night. 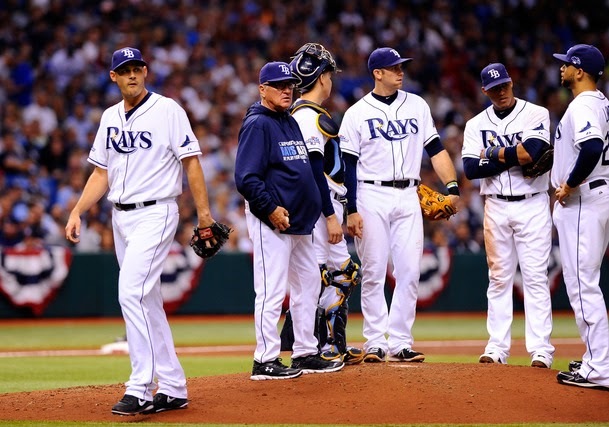 The Tampa Bay Devil Rays' playoff run came to a jarring halt last night, as they were dumped out of the playoffs by the Boston Red Sox. Their 1-3 defeat was of course entirely the fault of the playing staff and absolutely nothing to do with Super Genius Manager Joe Maddon. The latter pulled out all the stops in trying to lift his over-matched team past the financially superior Red Stockings. There is literally nothing Joe 'Genius' Maddon could have done above and beyond the incredible measures he went to in trying to force a game 5 in the playoff series. Maddon turned what should have been a 3 hour game into a 5 hour marathon with an incredible 9 pitching changes. He did this because he knows better than you. He also made other shift, lineup and defensive positioning changes that we would get into but they would be too hard to explain, because, as we know, Joe Maddon is a genius. You could try to understand the moves he makes, however, you just wouldn't be able to comprehend the sheer depth of his thinking. It is not only the common fan that is left feeling like an idiot in the enormous wake of Joe Maddon's giant intellect. A low, awed gasp went up among the assembled scribes, as they looked at each other, many with mouths agape. Maddon noticed the reaction and sat back in his chair, waving his hand regally, he sighed, 'do you need me to explain that word?' to which a couple of the press confirmed in the affirmative. Joe Maddon ladies and gents.